Can you remember when this came out in 1985? 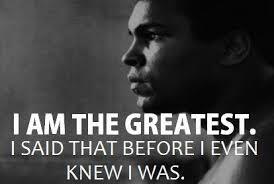 This re-minded me of the great Mohammad Ali who we discuss later. Continuing with our tools to set and achieve our goals, we look at our FUTURE HISTORY or Going Back to your future. The ability to close your eyes and see in your minds eye, your right side,the creative imaginative side of your brain, the goal you have being achieved. What will it feel like, look like? What sights sounds smells with there be? 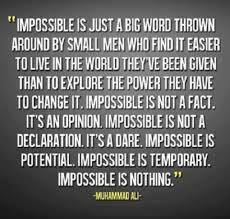 This is one of Mohammad Ali’s secrets to his extraordinary success. The mental ability to repeatedly see in his minds eye a goal being achieved, before it happens. This give us the confidence to see goals as a “Future History” as Ali said. It is an event in the future, its not happened yet, but he had visualised it and replayed it so many times in his mind that for him it was already history, already achieved. This is a powerful mental technique for goal settting and achieving. And that vision, that ability to see a Future History inspired him, whenever anyone asked him a question doubting his ability to win, or any negative thoughts entered his mind. He could see Foreman on the canvas floor, feel the vibration of the deck, hear the roar of the crowd, smell the linament on his skin, see the flashbulbs of cameras, feel the pain his body had taken, taste the sweat and blood in his mouth guard. All his senses were stimulated in his imagination , it was such a clear vision of a future event. So this month of May what will you see and tell people you will do be or have before you actually achieve them? There is a challenge for you? Are you up for it? Have you had enough of the same old? What really inspires you? Will you make time to think differently about your goals and learn how to see with the clarity of Mohammed Ali and develop your own Future History? Its your’s no one elses so take control. If you would like some more details our MindStore Goal setting planner it is available with our compliments. Simply email us your postal address to: enquires@mindstoreaustralia.com and we would be delighted to send one out to you. Then you will know….. IT JUST WORKS!